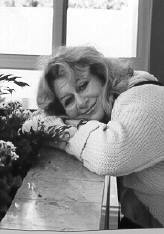 Lillian Boraks-Nemetz is a poet and a novelist who was born in Warsaw, Poland and survived the Holocaust as a child. She escaped from the Warsaw Ghetto and lived in Polish villages under a false identity. She has her M.A. in Comparative literature from the University of British Columbia and has taught Creative Writing at UBC. Boraks-Nemetz is best-known as the author of a young adult novels that include The Old Brown Suitcase, a fictional account of a 14-year old immigrant girl, Slava, who comes to Canada from Poland after the Second World War. Her suitcase is filled with memories of the Warsaw Ghetto where she left behind her parents and sister. Her problems of adjustment to her new life in Canada as a teen-aged immigrant Jew are juxtaposed with her heart-wrenching memories of her lost childhood in Poland. This book won the Sheila A. Egoff Prize, among others awards. The other novels in her Slava trilogy are The Sunflower Diary (Roussan, 1999) and The Lenski File (Roussan, 2000). Lillian Boraks-Nemetz revisited her autobiographical story for an adult novel, Mouth of Truth (Ekstasis 2017), also inspired by her experiences. "This new story is based on true events and speaks to a completely different, adult audience," she says. It's a story about trauma and child abuse, experienced by war children, and how it affects their adult lives, also affecting offspring. Tapestry of Hope (Tundra, 2003) - Anthology, co-edited with Irene N. Watts. Sheila A. Egoff B.C. Book Prize for Best Children's Book, for The Old Brown Suitcase, 1995. Shortlisted for the Bilson Prize. Finalist for the Red Maple Reading Award for The Sunflower Diary, 2000. Following her successful trilogy of young adult novels, Warsaw Ghetto survivor Lillian Boraks-Nemetz uses poetry to explore the spiritual and psychological struggles of children who survived the Holocaust in Ghost Children from Ronsdale.